If you try to configure using a Gmail address in the Maintenance ⇒ Email Sending Configuration window, and the SMTP Server you set up there is "smtp.gmail.com" (the current correct one for Gmail), you will probably receive a large message box about there being a problem doing this, and offering you an option to Grant Access for Less Secure Apps. This page explains that option. Note: In releases prior to number 2.22, there used to be another option, Authorize ACCOUNTS, which allowed you to give just a specific authorization to Google for ACCOUNTS to send emails. We no longer support that option, because Google recently added a lot of complex criteria to allow software companies to do that, which unfortunately seemed prohibitively complicated for Software4Nonprofits to satisfy.. 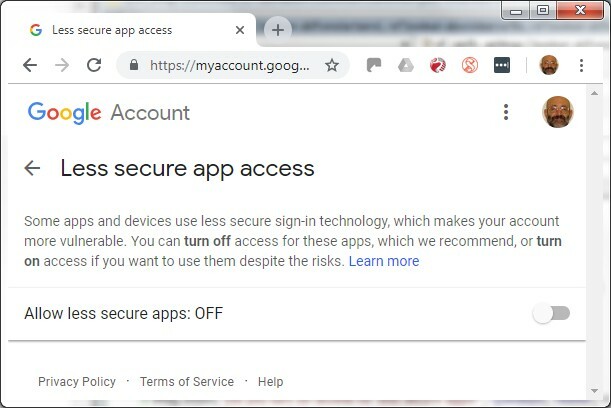 This grants access to your Gmail account, as long as you supply the correct username (your email address) and password, to all applications that Gmail considers to be insufficiently secure, including ACCOUNTS. If you click the slider shown in the bottom right of the image above, it will immediately turn that on. You can then close that window. Google will likely then immediately send you an email with the Subject "Critical security alert", asking you to click through (using a Check Activity button) and confirm that it was you making that change. You will probably have to get that email, click that button, and answer Yes on the web page that comes up, before sending email will work. Back in ACCOUNTS after doing that, you can follow the prompts to try emailing again, and it should work. If it doesn't, please double-check that you have entered the correct Gmail password in the Password field in the configuration window (click "Make password visible, rather than stars" below that field, to make sure you can see it).